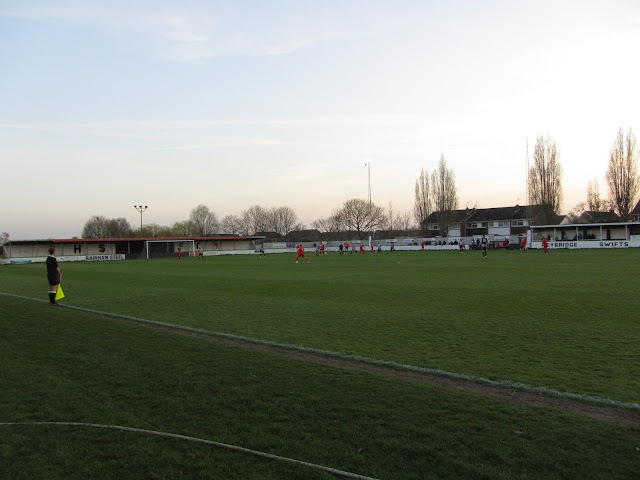 My twelfth stadium of 2013 was on Tuesday 23rd April 2013 at Scraley Road in Heybridge, Essex. 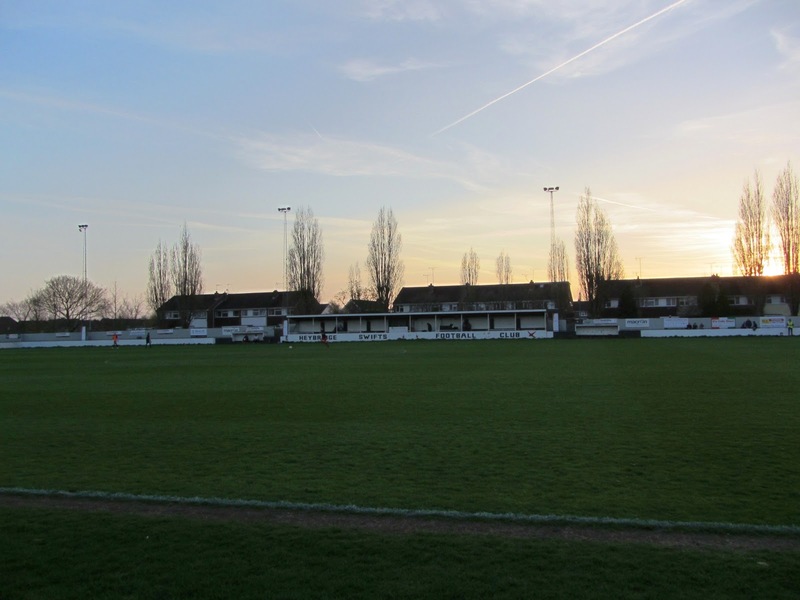 The match was Heybridge Swifts vs. Grays Athletic in the Isthmian League Division One North. Scraley Road is on the eastern outskirts of the village of Heybridge and is 6 miles from the nearest railway station at Witham. The venue has been home to the club since 1966. The Main Stand is level with the half-way line on the eastern side of the ground. Built in 1995, this covered all-seater stand can hold a couple of hundred fans. This side of the venue also has a television gantry close to the Main Stand. 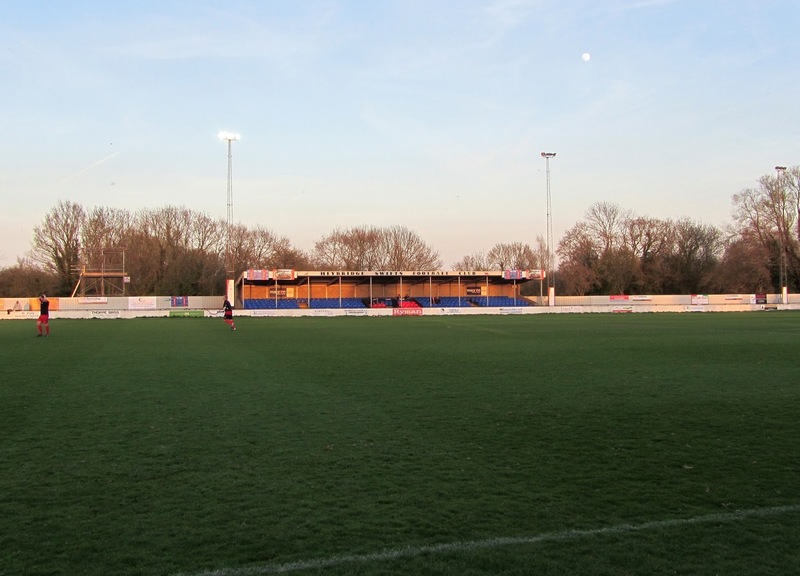 The other seated stand is directly the opposite and consists of rows of wooden benches. Both stands have a number of supporting pillars. Most of the area behind the goal at the southern end of the ground is taken up by a covered terrace. The South Stand has raised concrete a platform for standing and like the other two seated areas also contains supporting pillars. The other end of the ground is uncovered standing although this is also where all the club facilities are located. A pleasant clubhouse, a seating area of benches and the player dressing rooms all reside here. The game was not a bad one with two fairly even teams battling out in their attempts to gain promotion at the end of the season. Grays came into the game having won their last 17 league games in a row and they shaded an open first 45 minutes. However, it may have been a different game had Heybridge taken an early lead when their striker went clean through with the goalkeeper only to see his tame effort saved. After this Grays created a number of chances and only a goalline clearance prevented them taking a 20th minute lead. The visitors made the breakthrough in the 44th minute as a looping cross into the box found the head of Joao Carlos who nodded into the bottom corner of the net. Their lead did not last long after the restart though as it took only 30 seconds of the second half to elapse for Heybridge to equalise. The Grays goalkeeper misjudged a long throw and the ball bounced over him allowing Luke Callendar to head into an open net. It was end-to-end football after this with Heybridge having a shot cleared off the line and Grays having a goal disallowed for a foul on the keeper. In the 53rd minute Grays scored a goal of real quality. The move began with some neat build-up play before the ball fell to Kris Newby on the right-wing. His cross was met with a powerful header into the back of the net by Jack West to restore Grays' one-goal advantage. Heybridge made a real effort to pull the game back to 2-2 but some last-ditch defending saved the visitors on several occasions as they held out to extend their winning streak to 18 games.